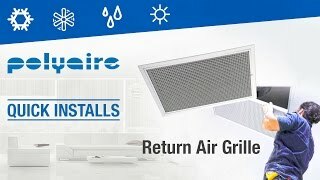 A Return Air Grille is a vital component of a reverse cycle air conditioning system. Installing the hinged metal grilles from Polyaire is simple, and a very quick process because of the innovative design of our components that help save time and make installation tasks easy. Polyaire flexible duct is rated up to R2.0 and available in all industry standard sizes. A popular architectural product! 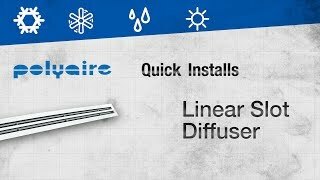 The linear slot diffuser looks great in any home, here is a demonstration of how to install them with your ducted air conditioning. 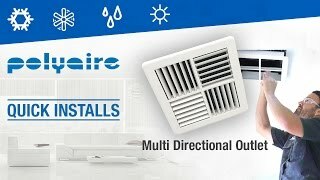 A quick demonstration on how to install multi directional outlets for your ducted air conditioning system. Our new air conditioning fittings are built to last. They will not warp or distort under pressure and will maintain form. They will also help save the installer money when compared to weaker generic fittings that are easily damaged on installation sites.